We’re going to delve into the world of cheesemaking science for beginners. Learning about cheesemaking at home can be a fun, easy project. Cutting into your first finished cheese creation is a pretty magical experience. After all, that wheel of cheese came from something as humble as milk. With the addition of heat, cultures, and time, turning milk into cheese seems like a cross between chemistry and alchemy. This sense of a science-art hybrid arises as cheesemaking experiments result in different flavors and textures for the same cheese. A slight change in ingredients or process can make a completely different cheese. For example, look at artisan cheeses. They are made by professional cheesemakers, but they can vary throughout a season or even from wheel to wheel. These variances are often called “terroir” which refers to differences in flavors, textures, and characteristics of food as a result of how or where food is grown or made. 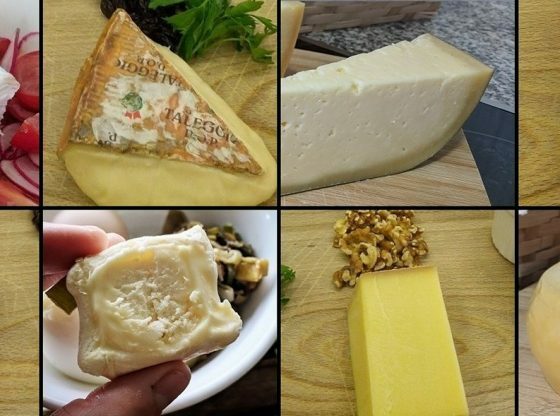 When it comes to cheese, milk, cultures, and process all contribute to “terroir” and each element changes in controllable and uncontrollable ways. For the home cheesemaker, variances can mean each wheel is a delightful surprise of flavors and textures. Indeed, it can be fun and interesting to vary ingredients and tweak processes to create something different every time. Differences can be delightful when experimenting, but they can also be frustrating. A cheesemaker might be trying to recreate a delicious experimental cheese to find the result is not the same every time. Variability arises in even the most controlled cheesemaking environment, but they can be demystified with understanding the science behind the flavor and texture of the cheese. Keeping the science in mind can help enhance the delightful nature of terroir. To get started cheesemaking at home, I recommend the following books. Cheese flavor starts with milk. Milk is a solution 87.7% water. The rest is lactose, fat, protein, and minerals. The amount of each component depends on the species, breed, and diet of the animal producing the milk. Macro-nutrients are a contributor to cheese flavor, but diet is the heart of cheese terroir. For example, the milk fat for a Jersey cow is around 5% while that of a Holstein is around 3%, a sheep is more than 7% and a goat is around 4.5%. In addition, the size of the fat globule is different for different species and breeds. While larger fat globules are desired for cheesemaking, the homogenization process breaks down fat globules to prevent milk separation. Proteins in milk are shaped like pom-poms. During the first steps of cheesemaking, acidification, and coagulation, proteins link together to form networks that trap fat, water and lactose. This is the basis for the structure of cheese. When proteins are intact, they form stronger networks, but they are damaged with agitation and temperature. Pasteurization, especially high temperature and ultra-pasteurization causes proteins to break apart. Milk held in cold storage and agitating milk also damages proteins. However, milk can have more nuanced flavor than “milky-ness.” My mom was raised on raw milk from her uncle’s small herd of cows in Kansas. She once told me that when she was growing up, she hated late fall milk, because it tasted like weeds. Her favorite was spring milk because it was sweet and grassy. The winter milk wasn’t bad; it just tasted like salty straw. Everything an animal eats contributes to the flavors of its milk, which is one component of terroir. Most people are not aware of these seasonal variances because commodity milk is meant to be consistently flavored all year. However, the milk flavors will ultimately get concentrated in the curd of cheese, even if the flavors are bland. Award-winning cheeses tend to come from cheesemakers with their own milk-producing animals that are raised with rigorous herd management. They are made from the freshest milk, often just hours after milking the animals. The milk is unhomogenized, so the fat globules are intact. Sometimes they are not pasteurized, and even if they are, the gentler method of vat pasteurization that does less damage to milk can be used. Unfortunately, the home cheesemaker is limited to milk available off the shelf. This is often Holstein cow’s milk that is homogenized and pasteurized. Goat’s milk can be cost-prohibitive and sheep’s milk is virtually unheard of in most markets. Regardless of the species or breed, the animal was probably milked more than 48 hours before it reached the grocery store. But all is not lost for the home cheesemaker. It is possible to source raw (unpasteurized) and unhomogenized milk in some places. Each state has its own raw milk laws, so check with this raw milk finder for sources. If raw milk is not available, start with milk that is not ultra-pasteurized which are flash-heated to 280°F then rapidly refrigerated. This process destroys proteins making it nearly impossible to make cheese. Look for milk from local dairies and inquire about the dairy breeds they keep and their pasteurization process. Short of milking your own animals, there is no way around getting chilled milk, but it may be possible to coordinate locally to get the freshest milk possible. Also, invest some time tasting the milks available or get friends together for a milk sampling party and use a tasting notes sheet for blind tasting. While most commodity milk producers aim for consistency, there may be subtle differences between producers. Adding ultra-pasteurized, shelf-stable, and powdered milk into the mix highlights flavor differences. The flavor of milk is the largest contributor to cheese flavor, so it is worthwhile to seek out the best milk. While a hobby cheesemaker might consider tending to a small herd of dairy animals for their homemade cheese, most people are limited to what is commercially available. It will likely take trial and error to find a milk that gives the best result. In addition to getting flavor from the animal’s diet, raw milk cheese improves with the naturally beneficial bacteria and enzymes inherent to the milk. Pasteurization eliminates bad pathogens and increases the shelf life of milk but is also indiscriminately kills bacteria such as Lactobacilli, Lactococci, and Streptococci which make cheese delicious. Turning raw milk into cheese also requires additive, but those who only get pasteurized milk must rely on additives to develop flavor. Cheese flavor develops through myriad chemical and biological processes. The Cheese Science Toolkit website is a great place for exploring these processes in depth, but here is a short list for beginners. Home beer-brewing and wine-making stores typically stock some cheesemaking supplies. New England Cheesemaking, Cultures for Health, and The Cheesemaker are excellent online sources for cheesemaking ingredients, tools , and books as well as guides for using additives and making cheeses. With a pH of 6.5 to 6.7, milk is slightly acidic (pH = 7 is neutral). Starter cultures are lactic-acid-producing bacteria that, when added to milk, lower its pH. Starter cultures are freeze-dried so they remain dormant until ready to use. They are typically purchased in packets with blends of Lactobacilli, Lactococci, and Streptococci. The blends are specific to the type of cheese is makes. Using these pre-made blends is a great place to start. Adding starter culture to warm milk wakes the bacteria from dormancy. The milk presents a readily-available feast of lactose and the bacteria multiply while converting lactose to lactic acid. This acidifies the milk in a process called ripening. The acid gives cheese sourness and tang. The tip of each strand in the protein pom-poms has a negative charge on it. So, as the milk acidifies, these tips get neutralized which causes the proteins to clump together. This clumping is acid coagulation. If ripening proceeds until the pH is 4.6, the clumping becomes prominent. This clumping can be accomplished quickly by adding vinegar, lemon juice, or citric acid directly to milk to make a simple ricotta. However, the lactic acid produced by bacteria lends more complex flavors to the cheese. 6 Tablesoons Lemon Juice or Apple Cider Vinegar may be substituted. Pour milk into a sauce pan. Add citric acid and salt. Mix well. Heat to 180-190°F, stirring occasionally (not vigorously) to prevent scorching. After about 10 minutes the milk will begin to curdle. As the whey and curds separate and the whey turns clear, remove from heat. Cover and let sit, undisturbed for 10 full minutes. May sit longer to achieve strong curds and whey separation. Ladle or spoon curds into the lined colander. Tie the corners of the muslin around the spoon handle. Hang curds over bowl or pot for 20-30 minutes for a drier texture. Cheese made by allowing ripening to proceed until the pH is 4.6 is usually softer because the acid dissolves calcium which is important to make the stronger protein networks that hold a firm cheese together. So, a firm cheese needs rennet. Rather than protein pom-poms loosely clumping together, rennet reacts with proteins allowing them to lump together tightly with calcium bonding them together. This creates a network of proteins that trap liquid and fat. Adding calcium chloride to milk before rennet encourages better coagulation. This is not meant to imply a soft cheese does not use rennet. 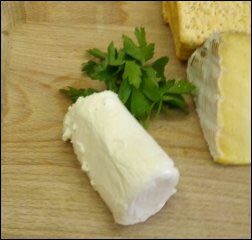 In fact, soft spreadable cheeses like fromage blanc, cream cheese, and chevre use rennet. The interplay between acidification and rennet is a complex relationship. 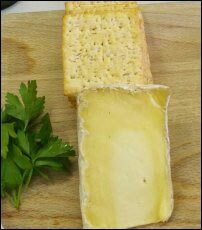 The texture of cheese is a result of a combination of ripening time, acidity rennet addition, draining, and forming. Each recipe is designed to make different cheeses using different combinations of these. The term rennet is a catchall for all cheesemaking coagulation enzymes. The main enzyme responsible for coagulation is chymosin. Traditionally, rennet is a non-vegetarian coagulant make of chymosin and other enzymes. It comes from the fourth stomach of a ruminate animal not weened from milk. Vegetarian coagulation enzymes can come from fungi and thistle plants, but it most commonly is produced with genetically engineered microbes modified with a gene to produce pure chymosin. 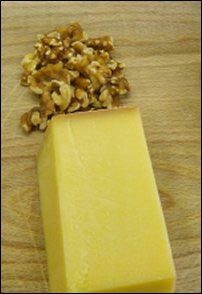 Although the impacts are subtle, some cheesemakers find traditional rennet produces better-flavored cheese. Molds typically come in three color varieties – blue, white and red – and contribute to cheese types like blue Roquefort, Camembert, and Epoisses. Mold are added with starter cultures, but they do their magic during aging/affinage. They cheese chemistry and biology to produce different flavors. A blue mold like Penicillium roqueforti breaks fat down into fatty acids and methyl ketones. The methyl ketones give blue cheese a pungent and peppery flavor. White molds like Penicillium camemberti grown on the outside of cheese and cause the surface further acidify. This causes calcium to move toward the surface and leave the center of the cheese runny. In washed rind cheese, Brevibacterium linens, a bacteria rather than a mold, reduces surface acidity which can cause crystals. Mold, bacteria, and process are codependent for developing flavor and each flavor is not exclusive to a particular mold. For example, blue mold also reduces acidity which explains why crystals might develop inside blue veins of cheeses like Gorgonzola. Two other additives a home cheesemaker might consider are annatto and lipase. Annatto is food coloring derived from achiote tree seeds. It produces orangey color in cheeses like American cheddars. Sharpness can be impossible to develop in cheese using commodity milk because the lipase enzyme is destroyed in pasteurization. 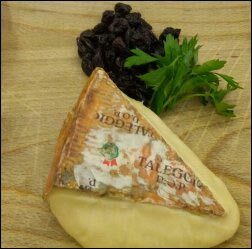 Adding lipase powder enhances cheese flavor to produce sharp flavors like those in Romano. How flavor develops from different combinations of milk and additives is a result of many complex chemical and biological processes that a cheesemaker tries to control with time, temperature, and procedure. Scientists have been studying the complex flavors of cheese for decades. This short list of additives is a glimpse of what a beginner cheesemaker might encounter. Although additives help guide the flavor of the cheese, the real heart of the cheese flavor is the milk.